When you step into someone’s kitchen, one of the first things you probably notice are the countertops. Having excellent lighting, comfortable seating, and a stove in your favorite style are all important, but countertops remain a focal point. Whether you appreciate modern sleek countertops or something a little more classic, you want to be sure your countertops set the mood for your kitchen. There are a few ways to ensure that happens when doing kitchen remodeling. The first thing to consider is your own lifestyle. If you have pets or children in your home, you may not want to invest in countertops with sharp edges, as you might see with some granite options. This may not be as much of a consideration if your children are older, but preventing injury is always important. 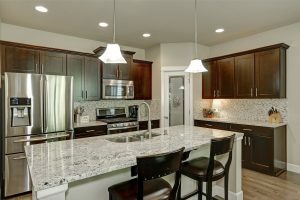 The good news is that even granite countertops come with numerous edge choices, so you can select an option that is beautiful without being dangerous. Another thing to consider with kitchen remodeling is your own personal style. Many countertops come in dozens of colors, which means you can show your creativity every time you walk into the kitchen. However, keep in mind that the finish of the countertops matters as well. If you want a softer, matte finish, go for a honed finish. If you prefer a darker shade, polished finishes should suit you well. Nobody wants to spend ages on maintenance of their countertops, but it’s important to consider this along with the other important aspects of choosing the right material. For instance, laminate countertops may require very little maintenance. The probably is they also have little effect on beauty or resale value of your home. On the other hand, choosing granite, quartz, or other natural stones gives both elegance and value. Keep these tips in mind as you choose your perfect countertops and you will find yourself pleased with the results of your kitchen remodeling.